Tuukka Rask makes 18 saves in shutout. BOSTON (AP) — Jimmy Hayes emerged as an unlikely source of offense for the Bruins. Hayes scored the game’s only goal early in the first period and Tuukka Rask made 18 saves as Boston held on for a 1-0 win over the Los Angeles Kings on Sunday. Hayes’ goal was his first in seven games and only his second in 28 games this season. “You try to help the team whenever you can, and today I got an opportunity so it’s nice to cash in on one,” Hayes said. It was a much-needed boost with leading scorer David Pastrnak sidelined after having right elbow surgery on Friday. Pastrnak’s 19 goals rank second in the NHL behind Pittsburgh’s Sidney Crosby (21). Bruins coach Claude Julien hopes Hayes’ performance serves as a spark after his sluggish start. Hayes ranked ninth on the team with 29 points (13 goals, 16 assists) last season. “He resembled probably the older Hayes that we had at times last year than the one we’ve seen this year,” Julien said. Rask recorded his fourth shutout of the season for the Bruins, who improved to .500 at home (8-8-0) after losing two straight games and five of six coming in. “It’s one of those games that you only need one bad bounce or one really good chance for them to tie it, and today we didn’t even give them that,” Rask said. Rask tied Minnesota goalie Devan Dubnyk for the league lead in shutouts, and now has 34 for his career. Peter Budaj had 29 saves for the Kings, who had won their previous two games. Los Angeles was outshot 30-18. “Hey, we just played our fourth game today in 6 1/2 days and we played our (butts) off again today,” Sutter said. Sutter opted to sit the struggling Marian Gaborik, who has just one goal and three assists through nine games. “We have that right in the locker room as players and coaches to have high expectations of players in terms of how they play,” Sutter said. Colin Miller’s wrister from the top of the right circle caught a piece of Hayes’ stick and zipped past Budaj 4:20 into the opening period. Hayes was initially credited with an assist on Miller’s goal, but the call was changed. Dominic Moore also assisted on the goal. “Just being in the right spot at the right time,” Hayes said about his timely score. Hayes has gone 45 games without an assist dating to Feb. 22. He is three points shy of 100 for his career. 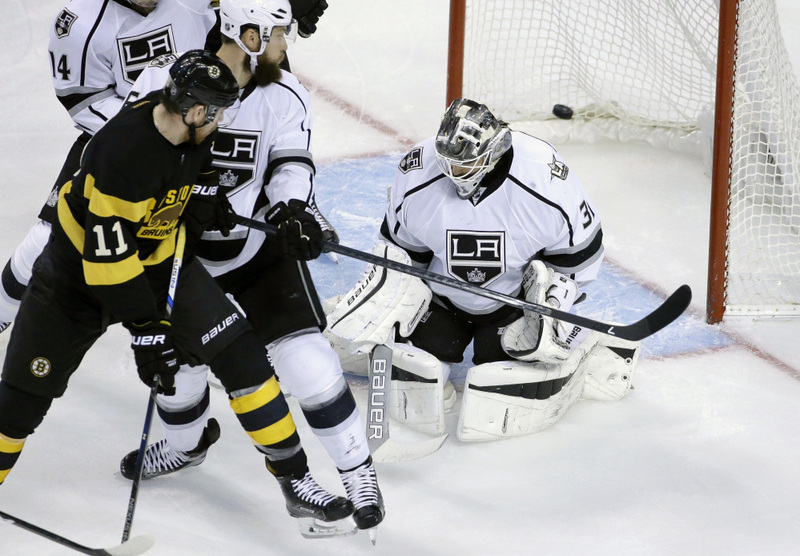 Kyle Clifford went to the locker room at 3:24 of the third after taking a hit from the Bruins’ Adam McQuaid while chasing a puck in the corner. He returned later in the period. NOTES: Pastrnak is expected to miss at least one more game. … Bruins D Kevan Miller returned after missing Thursday’s game with the flu. … Kings D Brayden McNabb (broken collarbone) practiced Saturday for the first time since his Oct. 29 injury. He likely will not play for the rest of the Kings’ road trip. … D Colin Miller was a fifth-round draft pick of Los Angles in 2012. He was traded to Boston in a package for LW Milan Lucic on June 26, 2015. … The Bruins assigned D Matt Grzelcyk to AHL’s Providence on Saturday. Kings: At Columbus on Tuesday night in the fifth of nine straight games away from home. Bruins: Host the New York Islanders on Tuesday night in the finale of a three-game homestand.